Add your UOB One Card on the above mobile payment applications to tap and pay securely with your mobile phone at more than 10,000 retail outlets in Singapore. What's more, you can earn the same rebates on mobile payment as you do with your physical UOB One Card. The participating merchant, agent, supplier or service provider has the discretion to determine which goods and services are provided under this Promotion. 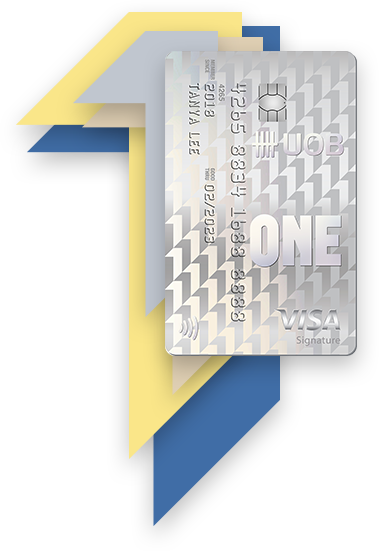 If any Eligible Cardmember is subsequently discovered to have exceeded the number of offers entitled, is ineligible or not entitled to participate in the Promotion, UOB reserves the right to forfeit/reclaim the Offer or dispose of it in such manner and to such persons as UOB deems fit without any liability on the part of UOB to any persons. No payment or compensation whether in cash, credit or kind shall be made by UOB for the forfeited/reclaimed Offer. Where the Offer was awarded to / redeemed by an Eligible Cardmember who was subsequently discovered to have exceeded the number of offers entitled, is ineligible or not entitled to participate in the Promotion, UOB shall be entitled to claim from the Eligible Cardmember a reimbursement for the value of the Offer or the retail value of the good / services provided. The Offer is not transferable or exchangeable in part or in kind for cash, credit or other goods and services. UOB reserves the right, at its discretion, at any time, without notice or assigning any reason thereof, replace or substitute the Offer with any other gift of equal or similar value selected by UOB. UOB will not be liable or responsible for any defects, deficiency, quality, merchantability, the fitness or any other aspect of the goods or services provided under the Promotion, or the acts or defaults of the merchant, agent, supplier or service provider of the goods or services provided under the Promotion. UOB is not an agent of the merchants, agents, suppliers or service providers. Any dispute about the quality or service standard must be resolved directly with the merchants, agents, suppliers or service providers. The merchants, agents, suppliers or service providers may impose conditions for the Offer; and the provision of the goods or services under the Promotion. UOB will not be responsible or liable for any injury, loss, claim or damage whatsoever or for any charges, costs or expenses of any kind whatsoever suffered or incurred in connection with the Promotion howsoever arising. UOB and the participating merchants, agents, suppliers or service providers reserve the right to vary/amend these Terms and Conditions without prior notice or giving any reason or being liable to any person. No correspondence appeal or claims will be entertained. Participation in the Promotion is subject to these Terms and Conditions and the Eligible Cardmembers are deemed to have accepted these Terms and Conditions when they participate in the Promotion. The Eligible Cardmembers shall indemnify UOB for any claims, expenses, actions, losses or damages or costs (including legal costs on a full indemnity basis) made against or incurred or sustained by UOB in connection with any breach of these Terms and Conditions. The prevailing terms and conditions under the UOB Cardmember Agreement ("Standard Terms") will continue to apply and be binding on the Eligible Cardmembers. Please visit uob.com.sg for the Standard Terms. In the event of any inconsistency between these Terms and Conditions and the Standard Terms, these Terms and Conditions shall prevail to the extent of such inconsistency. In the event of any inconsistency or discrepancies between these Terms and Conditions and any brochure, marketing or promotional material relating to the Promotion, these terms and conditions will prevail. for any breakdown or malfunction in any computer system or equipment. UOB shall not be responsible for any loss to or expenses of any Eligible Cardmember or any other person in connection with the Promotion, howsoever arising. However, UOB will be liable for the Eligible Cardmember’s direct loss to the extent such loss is caused directly by UOB’s fraud, negligence or willful misconduct. UOB’s decision on all matters relating to this Promotion shall be final, conclusive and binding on the Eligible Cardmember. UOB shall not be obliged to give any reason or enter into any correspondence with the Eligible Cardmember or any persons on any matter concerning this Promotion and no appeal, correspondence or claims will be entertained. Notwithstanding anything in these Terms and Conditions, UOB reserves the right at any time and from time to time in its absolute discretion to terminate the Promotion or to determine and/or amend, by adding to, subtracting from or varying of, any of the Terms and Conditions herein, including but not limited to varying the Promotion Period, the eligibility terms and criteria, and the timing of any act to be done, without giving any reason or prior notice or assuming any liability to any Eligible Cardmember, and all Eligible Cardmembers shall be bound by these amendments. While all information provided herein is believed to be correct and reliable at the time of publishing or posting online, UOB makes no representation or warranty whether express or implied, and accepts no responsibility or reliability for its completeness or accuracy. A person who is not a party to any agreement governed by these Terms and Conditions shall have no rights under the Contracts (Rights of Third Parties) Act (Cap. 53B) to enforce or enjoy the benefit of any term of such agreement. These Terms and Conditions shall be governed by the laws of the Republic of Singapore and all Eligible Cardmembers who participate in this Promotion shall be deemed to have irrevocably agreed to submit to the exclusive jurisdiction of the courts of the Republic of Singapore. Copyright 2018 United Overseas Bank Limited Co. Reg. No. 193500026Z. All Rights Reserved.